Developments in the interrelated industries surrounding air transportation and space exploitation continue to give rise to new and challenging problems in international law. As more and more countries and private entities use outer space for satellite-based systems of air navigation, telecommunications, and surveillance, significant economic and environmental issues loom ever larger. Moreover, the ongoing exploration of space and celestial bodies in search of commercial possibilities poses new questions, ranging in substance from the proliferation of space debris to intellectual property rights. The Warsaw System of intercarrier liability, although still serviceable, is severely strained by such developments as the products liability of aircraft and satellite manufacturers and the liability involved in the construction and launching of space stations and multipurpose satellites. 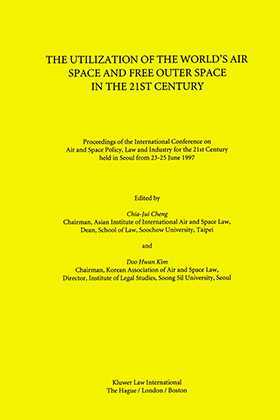 Aware of the massive convergence of these legal and political challenges, over 200 air and space experts met in Seoul in June 1997 to search for solutions and to promote and strengthen international cooperation in this crucial sphere. Twenty-three countries were represented. This book is the record of their presentations, discussions, recommendations, and conclusions.